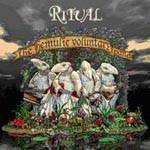 More information: With 'The Hemulic Voluntary Band' Ritual, featuring Kaipa singer Patrik Lundström, have recorded their most adventurous album to date. This fourth studio album harks back to Ritual’s self-titled debut from 1995 which is still highly praised within prog circles. The tracks are following a story of Tove Jansson’ s Moomin world and melt prog, folk, complex and melodic parts into that typical Ritual sound. A MUST FOR FANS OF KAIPA, FLOWER KINGS, ETC!